Samsung’s mobile charge is no fluke. The company’s range of Galaxy S smartphones have fused the very latest technologies with industry-leading hardware. Combined sales of its Galaxy S and Galaxy S II smartphones exceed the 40 million mark, with the latter surpassing 20 million units shipped in 10 months. Whilst it’s some way off Apple’s 37 million iPhones shipped in one quarter, the Galaxy S II is thought to be the most popular Android smartphone to date. Given the success of the Galaxy S lineup, consumers are increasingly looking to see what Samsung has planned for its next flagship device — the Galaxy S III. Rumours have swirled around the possible launch of the Galaxy S III since the beginning of the year, when the Korean vendor announced that it would not hold a press event at this year’s Mobile World Congress, choosing to unveil its new smartphone later in the year at a dedicated event, sometime in Q2. 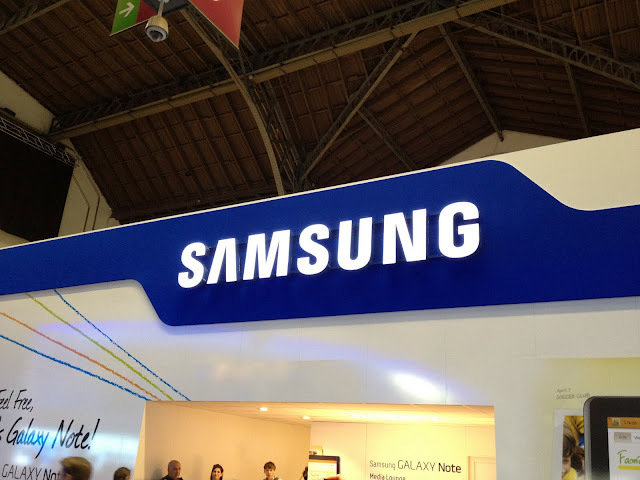 This set off a chain of reports that suggested the Galaxy S III would come in March, at an event in France. We later revealed this was not the case. More recently, reports have touted mid-April for a potential launch, after an Asian marketing company suggested plans would soon come together for a big London Olympic launch. The interesting thing to note here is that Samsung states that it will use Twitter to notify followers of the launch date. Samsung has increasingly taken to Twitter to stop rumours from gaining momentum but has seen it successfully use the social network to alert consumers about future Android app updates, product milestones and new product and service launches. Given that it has a huge worldwide presence, it would be easy for the company to field requests and issue releases regarding speculation via its respective regional press offices. Many local requests have to be referred to Samsung Global, so it can take some time to receive a response. However, given the global nature of Twitter, it is able to bypass these offices completely and is seeing an immense response from the messages it broadcasts via the service, despite the fact almost every tweet the company posts is written in Korean. As soon as a tweet is posted, the potential for it to spread is in the company’s hands — no hearsay, no misquotes or misinterpretation by a PR agency or localised subsidiary. This is exactly what happened when the company squashed the Galaxy S III rumour at the end of last week. 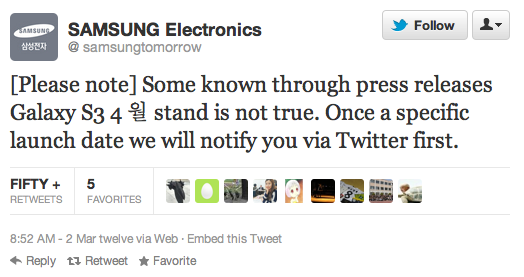 If a tweet can’t convey the message appropriately, the company often links to the Samsung Tomorrow blog. Teasing the launch of the Galaxy S III on Twitter, Samsung has ensured that the media and Android fans will monitor its official account from now, until the device is unveiled. In turn, the company will focus attention on other press releases, product announcements and the launch of new services. It’s a simple marketing ploy, but it appears to be working. Samsung says the Galaxy S III “will be unveiled in the first half of the year, closer to commercial availability of the product.” If you want to be the first to know, we will be brining you the latest in regards to the launch, or you better get following the Samsung Tomorrow Twitter account.